In a randomized, placebo-controlled trial, solriamfetol was reportedly safe and effect for excessive sleepiness in patients with type 1 and type 2 narcolepsy. LOS ANGELES—Solriamfetol both improves wakefulness and reduces excessive sleepiness in narcolepsy patients, according to phase 3 findings presented here at the AAN Annual Meeting in April. The results offer hope for a new therapy with a new mechanism of action that could be more practical and safer than existing medications. Solriamfetol, which used to be known as JZP-110, is a selective, low-potency dopamine and norepinephrine reuptake inhibitor that originally was assessed as a therapy for major depressive disorder and then was found to have wake-promoting effects. Patients with narcolepsy often go years without getting medical treatment, Dr. Thorpy said. The median age at onset is 16, but the median age at diagnosis is 30. And there is no cure for narcolepsy, he said. Type 1 patients exhibit both narcolepsy and cataplexy, a sudden, uncontrollable muscle weakness or paralysis that comes on during the day, often spurred by a powerful emotion such as laughter. Rare narcolepsy patients without cataplexy, but with a low cerebrospinal fluid level of hypocretin, are also considered type 1. Type 2 patients have narcolepsy without cataplexy, Dr. Thorpy explained. In addition to excessive sleepiness, typically measured with the subjective scale known as the Epworth Sleepiness Scale (ESS), narcolepsy patients also have impaired wakefulness, or the inability to actively remain awake, that is assessed by the objective measure, the Maintenance of Wakefulness Test (MWT). Researchers enrolled patients between ages 18 and 75 who had either type 1 or type 2 of the disorder and had an average sleep latency of less than 25 minutes on the first four trials of a five-trial, 40-minute MWT. They also needed to have an ESS score of at least 10, and a nightly total sleep time of at least six hours. They couldn't have a variable nighttime or variable work shift, or have a medical or psychiatric disorder, or be taking medications that could affect researchers' ability to evaluate their sleepiness. A total of 239 patients were randomized, and the analysis was completed on the 231 patients in the “modified intent-to-treat” population: those who received at least one dose of the drug and had baseline evaluation and at least one post-baseline evaluation of MWT or ESS. Patients received either placebo, or 75 mg, 150 mg, or 300 mg of solriamfetol. Before the study, the patients were rated by clinicians on the degree of their illness, and most patients were rated as moderately to severely ill. “These were patients that were severely affected because of narcolepsy,” Dr. Thorpy said. On the MWT, all of the treatment groups had an improvement after the first week, with a 13.7-point improvement in the 300 mg group, 10.3 points in the 150 mg group (both p< .0001 vs. placebo) and 5.6 points in the 75 mg group (p< .05 vs. placebo). The improvements compared to baseline were sustained through the 12 weeks of the study, but at week 12, the difference was not significant compared to placebo for the 75 mg dose. On the patient-reported ESS, improvements were seen after the first week as well, but the difference was not significant compared to placebo for the 75 mg group at the end of week one. But at 12 weeks, all of the dose groups showed significant improvements over baseline compared to placebo (p < .05 for the 75 mg group and p < .001 for the 150 mg and 300 mg groups). On the Patient Global Impression of Change, in which patients assess their change in their overall health and clinical status, all treatment doses of solriamfetol resulted in significant improvements at all time points compared to placebo, Dr. Thorpy reported. Headache was the most commonly reported treatment-emergent adverse event — reported by about 30 percent of patients in the 300 mg group and 22 percent of the 75 mg group. Seventeen percent of the patients reported nausea reported and 16 percent reported decreased appetite. One patient in the solriamfetol group, dosed at 150 mg, had two serious adverse events of non-cardiac chest pain and anxiety, but investigators didn't consider it related to treatment and the patient stayed in the study without it recurring. Rachel Marie E. Salas, MD, FAAN, associate professor of neurology at Johns Hopkins, who specializes in sleep disorders and chaired the platform session at the meeting, said the treatment could be a good option for many patients, particularly because it does not come with the same safety concerns as CNS depressants, such as sodium oxybate. The study was sponsored by Jazz Pharmaceuticals. Dr. Thorpy has received personal compensation for consulting, serving on a scientific advisory board, speaking, or other activities and has received consultancy fees from Jazz Pharmaceuticals and other companies. Drs. Gamaldo and Salas reported no related disclosures. •. AAN Annual Meeting Abstract CT.003: Thorpy MJ, Shapiro C, Mayer G, et al. A randomized, placebo-controlled, phase 3 study of the safety and efficacy of solriamfetol (JZP-110) for the treatment of excessive sleepiness (ES) in participants with narcolepsy types 1 and 2 (NT1/2) http://n.neurology.org/content/90/15_Supplement/CT.003. 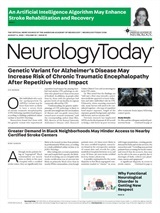 Neurology Today18(11):1,30-30, June 7, 2018.